Towards the end of the comments on of Rock Waterman’s blog entry about October’s General Conference an individual going by the name ~Clint~ brought up the Book of Abraham. And you know what, he’s right. The Book of Abraham is not an Egyptian-English translation of characters on the papyri. I’ve known this for a while and part of that is what prompted me to get the book, “The Joseph Smith Egyptian Papers” which was complied by H. Michael Marquardt. This book contains images of the pages of the Egyptian Alphabet and Grammar that was written by the scribes of Joseph Smith. The intent of this book is yet another attack on the Book of Abraham. It seems to focus on the claims the Joseph Smith had nothing to do with the Grammar and it was the scribes that wrote it. The book is fascinating. However the images of the pages are fairly poor quality. But it does have a transcription so that makes it easier. After reading ~Clint~’s comments it got me thinking about the Book of Abraham again. I pulled my copy of the Egyptian Papers off the shelf. I opened its tan, self published cover and stared(yet again) at the mind boggling symbols and supposed translations. This concept stuck in my mind for many days. And I wondered was it possible that someday the Book of Abraham might swing back to the other end of the pendulum and become faith promoting again? Often things experience that kind of shift back and forth. Could it happen to the Book of Abraham? I don’t really know. Yet, all of these thought sort of culminated in a sort of “AHA!” moment. Call it inspiration, or whatever. But I thought of something. 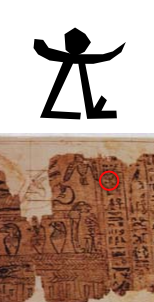 In all the arguments I have seen against the Book of Abraham pretty much all of them illustrate that Joseph Smith’s translation is not a correct translation of the Egyptian symbols on the papyri. To which apologists then state that the actual translation was not from the surviving pieces of the papyri. Or they say it was an inspired translation or something. Critics then have a variety of of comebacks. Etc, Etc, around it goes on and on. But what I’ve never seen before is an attempt at determining the validity of Joseph Smith’s translation of the Book of Abraham, independent of external factors. What I mean is, does Joseph Smith’s translation make sense in and of itself? Some Apologists attempt to distance themselves from the Grammar and Alphabet by claiming that Joseph Smith didn’t have a hand in it. Or that the symbols were written in later to “decorate” the document. So I came up with a hypothesis which is, that by examining, dissecting, and applying Joseph Smith translation of the symbols to most of (if not the entire) Papryi I can come up with an intelligible translation that makes sense. At most I may be able to identify the symbols used for the rest of the Book of Abraham; recover some sort of additional text of the Book of Abraham; and possibly even some sort of text of the Book of Joseph. At the very least this will be a huge disaster that will completely fall apart in my face. In truth, I’m expecting both options. And so my journey for the past few weeks had begun. And I expect that this experiment will take much more time before completion. But since it is taking so much time I thought I would share some of my discoveries. However not all are so clear cut. Additionally the degree that is used depends upon the relation a symbol has to others around it. I haven’t quite figured it out. Some people have claimed that this use of degrees allowed Joseph Smith to have a large amount of translated text while only using a small number of symbols. I don’t understand it completely, but I believe this accusation is actually mixing two parts of the translation; one, the system of five degrees, and two a system of numerical expansion that includes placing lines and other marks above or below the symbol to change it’s value. It also doesn’t address why Joseph chose to use only a small number of symbols for such a large translation. Why not give each symbol a smaller translation and use the rest of the symbols which are plentiful? Another way symbols are used is by combining them to form another symbol. A couple of examples if this are given in the text. One is Kiah broam- kiah brah oam-Zub Zool oan. This symbol is broken apart into five other symbols. Needless to say with this sort of system it is very complex and something I will be working on for a long time to come. My first breakthrough came on October 25 while I was sitting in my institute class. I thought I would see if there were any other complex symbols I could dissect. I found a symbol called Ho-hah-oop-an. To me it seems that this symbol seems to somehow relate to Jesus Christ as in intercessor. Pretty much all of these definitions point to some attribute of Christ. one that with delegated and redeeming power, and second in authority / being a swift messenger going before, and having redeeming power, as second in authority, and stands next to a or an the right hand of power. The earth including its affinity with the other planets; with their governing powers: which are fifteen / the earth; the sun, and the moon; first in their affinity; including one power. With these translations taken together the meaning of Ho-hah-oop-an is created. Even the name Ho-hah-oop-an can be derived from the names of some of the symbols from which it is made: Ja-ho-e(Jah-ni-hah)-oop, Toan. This relatively minor discovery was my first breakthrough in cracking Joseph Smith’s translation of the symbols on the Papryi. What makes this project so hard is that the Alphabet and Grammar only represents about half the characters of Papyri XI and I. And out of those, only about half have an actual translation in the document. Therefore I’m going to have to discover values of known characters and from them determine the values of the unknown characters. 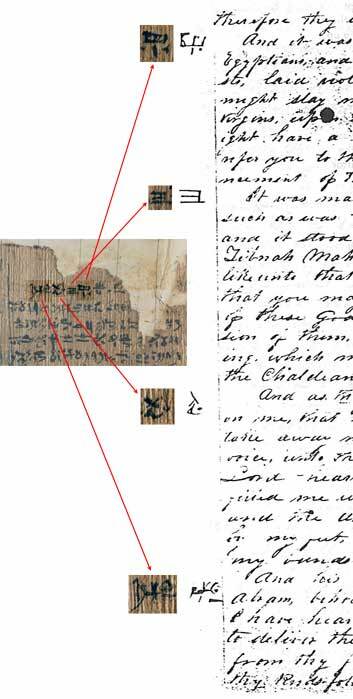 These images illustrate that the Egyptian Papers symbols correspond to symbols on the Papyri. And that they are ordered just like they are on the papyrus. 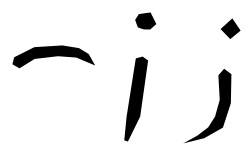 The next question becomes, do the translation of these symbols match to the translation given them in the Alphabet and Grammar? Here are a couple examples of what I have discovered so far. to the beginning of the creation, for the records have come into my hands, which I hold unto this present time. Now I know what you’re saying. This are the symbols invented by Joseph Smith to fill the gaps. So of course the translation works. Ok fine, lets look at some actual symbols from the papyrus. Alchebeth Ministers of God for I have purposed to take thee away out of Haran, and to make of thee a minister to bear my name in a strange land which I will give unto thy seed after thee for an everlasting possession, when they hearken to my voice. 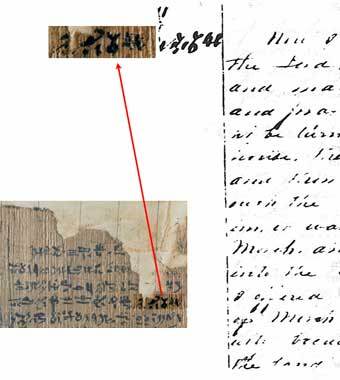 While my research is far from complete, and also far from making any conclusions as to the integrity of the translation Joseph Smith ascribed to the Egyptian symbols, it is intriguing. I’m fascinated by this and am looking forward to many more discoveries. Lastly I want to say that I’m not trying to prove any theory as to the origins of the translation. Was Joseph Smith making it up? Is there some secret meaning to the Egyptian symbols? Where the symbols simply means to receive revelation like the seer stones. I really have no idea. I would guess though that if Joseph Smith was making it all up and thus assigning random values to the symbols we would find the result to be gibberish and would not make an intelligible translation. If the translation is genuine(whatever that means, excluding direct translation of actual Egyptian) then the translation would be consistent and would make a intelligible translation. We’ll see what happens. As for later parts of this series I have no idea when I will be finishing them. If I make any major progress I’ll be posting it here. This entry was posted in Scriptures and tagged Abraham, Book, Book of Abraham, Egyptian, grammar, Joseph, Language, Papyri, Papyrus, scripture, Smith, symbols, translation. Bookmark the permalink. Something I’ve realized is that if you go back into all these dead pagan religions you’ll find glimpses of Mormonism in all of them. I can’t convince a damn soul of it, but that doesn’t prevent me from trying. I haven’t seen you at my blog in some time, Zomarah. Why not come by again? Check out, http://failmo.blogspot.com/2011/11/michael-and-rise-and-inevitable-fall-of.html and http://failmo.blogspot.com/2011/11/michael-rise-inevitable-fall-of.html (parts 1 and 2 of the same article). I touch on both ancient Greek and Egyptian religion. I have also been immensely satisfied with Zoroastrianism and Vedic religion (they share the same, Indo-iranian origin). Lastly, hoping to catch a glimpse the grand-daddy of them all–the Adamic religion–I even bought a book on the Proto-Indo-European religion. And yes, even that has been immensely rewarding. Times and places may change, but God is the same yesterday, today, and forever. Would love to find like-minded people to talk it over with, but it requires a creative mind–a lot of imagination! And I wondered was it possible that someday the Book of Abraham might swing back to the other end of the pendulum and become faith promoting again? Often things experience that kind of shift back and forth. Could it happen to the Book of Abraham? I don’t really know. My understanding is that that is what is going to happen, with all of the scriptures. As we get closer to the Second Coming, the Lord’s plan is to leave everyone without excuse. A fulfillment of that is that the actual records will come forth, the scientific evidence of correct translations, etc, will all come forth, all before His coming, yet largely to no avail, since by then the age of reason, or the scientific age, will have ceased and mankind will have returned to their superstitions and idolatry. My recent studies into Egyptian culture are really verifying the Mormon religion. It’s interesting the similarities one sees when one has “eyes to see.” For instance, I just recently found out that the ancient Egyptians worshiped a God called Atum, who is very much like the Adam described in the Bible (I blogged about that here: http://noblenarcissist.wordpress.com/2012/01/24/the-egyptian-god-adam/) I also stumbled upon an article by a Mormon guy who claimed that “Jewish tradition maintains that Abraham taught the priests of Heliopolis astronomy and other sciences.” That article can be found here: http://www2.ida.net/graphics/shirtail/heliopol.htm. The author gives no reference for this statement, but if true this would definitely would add to the Book of Abraham’s credibility. It would also explain why Joseph of Egypt felt free to marry the daughter of a priest of On/Heliopolis (God-fearing Israelites were not allowed to marry those outside their own religion). SUPPORT FREE SPEECH!!! DON’T MODERATE YOUR BLOG COMMENTS!!! Sorry, sometimes the comments get stuck in the spam filter. I fished yours out and posted it. Kudos to you, Zomarah, for taking on this project. Just looking at what you’ve explored so far makes my head explode. I’m in agreement with Noah on the “Mormonism” of so many ancient religions. A pity that so many of our own are so stuck in their pride that they aren’t even interested in seeing these truths. You’ve definitely picked an ambitious task. The Book of Abraham certainly has been a tough one for me to spiritually grapple with in the past. It was one of the issues that caused me to go agnostic several years back. Coming back to the gospel, I had to wrestle with it again, before I found an explanation I could be content with. The explanation I found works for me at present, although I’m always open to further light and knowledge. Your post inspired me to write a blog post on this. It can be found here: http://noblenarcissist.wordpress.com/2011/11/12/the-origins-of-the-book-of-abraham/. Haha. Great comments. But Rock and noble I feel less like this was something I pick and more like something that picked me. It just has consumed my thoughts and puts ideas into my mind at odd times. Fortunatly after about a two week honeymoon period I’ve been able to better manage my time on this project with everything else I need to do. I know what you mean by a topic picking you 🙂 For me it often takes time to ferment into something good. Have you listened to the Mormon Expression Podcasts regarding the Book of Abraham and Masonry? All the content/story of BoA that is “new” or being revealed as backstory is found in Antiquities of Free Masonry. He’s seeing a story being told in those papyri that matches what Antiquities of Free Masonry reports. So he’s trying to reverse engineer the Egyptian from that stand point. He believes the Masonic lore and believes that Egyptian is telling the same story all he has to do is connect the dots. To Joseph it solidifies his testimony that Masonry is ancient but corrupted in it’s priesthoods and he can unlock the keys of the Egyptian text because the story is the same. Of all the theories out there it makes a lot of sense. It’s a great podcast, can’t wait for his book where he lays it all out. WOW! I’m listening to those podcasts right now. This is AMAZING stuff! These podcasts with George Miller probably even beat out Daymon Smith’s podcasts about corporatism. I have to hurry and post this reply so I can keep listening. My understanding has always been that what has surfaced of Joseph’s Egyptian collection is not what he used as the source material for his translation of the Book of Abraham. As a result, I’ve always kind of just thought, “apples and oranges,” when I looked at the critical arguments against it being a real translation. If you believe we have the source documents, what has led you to that conclusion? Instead of cluttering Rock’s blog I came here to thank you for directing me to the Mormon Expressions podcast regarding JS and Masonry’s influence on him. Incorrect tradition is a lot more comforting than the truth, but, in wrapping my head around this new information I concluded for myself that truth is what I seek. You’re welcome. Yes, for me truth is those principles that I can apply in my life to bring myself more in harmony with God/the Universe. That is why I don’t have an issue with Masonry or The Book of Abraham. Because mythology, while not literally true does contain truth. After having done some basic research into Masonry I see that they contain a lot of applicable truth. Joseph Smith seems to have picked up on this as well. Considering that we are taught to accept truth no matter where it comes from then I see no problem in having close ties to Masonry. While the Book of Abraham may not be historically accurate I see no problem with accepting the truths within it.